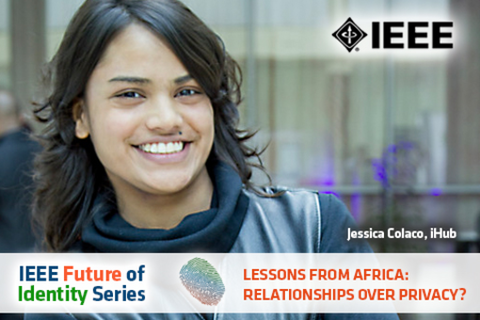 Africa is in the midst of a mobile revolution that is resulting in the unprecedented expansion of something Africans value most: relationships. This serves as a key innovation driver on a continent where mobile subscribers are predicted to hit one billion next year. The people of Africa embrace mobile technology to connect to communities, regions, countries and the world. This rapid ICT expansion has resulted in a “leapfrog” effect, resulting mobile technology innovation in critical sectors of the economy including banking, education, healthcare, agriculture, and community development. Local technology hubs spawn mobile applications and sharing of solutions as quickly as the technology allows. Join us to find out how, while the world debates technology, privacy and identity management issues, Africans are seizing opportunities to share, connect and enable communities through technology. Part of the IEEE Future Identity Series. She is also a Mobile and Robotics Tech Evangelist, Co-Founder of @WMIAfrica and @AkiraChix, @TED Global Fellow 2009 and upcoming Guitarist. She was named one of the top 40 women under 40 years in Kenya’s business scene by Business Daily on 2009, 2011 and 2012. She has organized several Mobile Boot Camps in Kenya as well as the first Facebook Developer Garage in Kenya in 2008 and has been featured by CNN Labs, Wired UK and other mainstream media.